Here is a list of my favorite drinks consumed in 2016, featuring bars in Milano, Rome, Turin, Singapore, Cape Town and San Francisco. It was hard to choose a best cocktail from the outstanding new menu at 28 HKS. Although The Horse without a Name, Coppertone, Stone Fence, and Instant Star were all world class drinks, the most memorable drink for me was The Five Foot Assassin, an ode to Phife Dawg of A Tribe Called Quest. The Five Foot Assassin is described as a hacked Bourbon St Frozen Daiquiri and it features Plantation Original Dark Rum, Mango, Lime, Allspice, Coconut Panda Cream, Nutmeg and get this, Angostura boba! It even comes with the fat plastic straw used for bubble tea. This brilliant recipe is by Joe Alessandroni, the creative mastermind at 28HKS. Fallen Fruit is a mix of wine, caramel, vanilla, fresh pears and curry leaf which is gently cooked using sous vide. At OoM, Luke Whearty's spinoff of Operation Dagger, there is an awesome tasting menu featuring cocktails paired with food dishes. In the case of fallen fruit, the drink is accompanied by an exquisite pear dish. Thanks to bartender Devin Cross for a great night of drinks and food. With Hot and Cold, you need to sip through the warm coconut/white chocolate cream before you get to the cooler base of tequila infused with pineapple and lavender. This drink is a pleasant surprise your palate and happens to be Luke Whearty’s best seller. Ever notice that thet first sip of your Martini is the best one? This is because at the beginning, you have the perfect dilution and just the right amount of essential oils from the twist of citrus fruit in your glass. Luca Marcellin of drinc. Cocktail and Conversation has the solution. Nothing like the first sip reproduces the emotion of the first sip 5 times, in one Martini cocktail. First, Plymouth gin, vermouth infused with cardamom and lavander and lemon bitters are carefully mixed together using a dropper. Then the concoction is shaken and poured into a test tube which is sealed with a cap and placed in a glacette to keep it cool. When ready, you swivel the Martini glass of choice into place, pour the first sip, and add the respective garnish. Brilliant! There are few bartenders able to tailor make cocktails that consistently blow me away. These elite bartenders, who likely have similar tastes as myself, include Mirko, Bonazzi, Pippo and of course Luca Pupo Cesaretti. On both of my visits to Jerry Thomas, I ended up saving one of Luca's drink recipes in my cocktail passport. On the latest visit, he filled out the last page of my passport with the mesmerizing "Pupo Cocktail", featuring Johnny Walker Black, Lagavulin 8, Antica Formula, Orgeat, Fernet, Benedectine and Angostura. I originally published my post on the best cocktails of 2016 on Dec 29, not expecting to have another emotion-invoking cocktail in the 2 remaining days of the year. What a mistake! On the fall drink list at MaG the team have taken inspiration from classic cocktail recipes, drinks that have defined the world of mixology. Instead of the usual variation or twist, they’ve done something totally insane. One great classic mixed with another, to create a completely new but delicious cocktail. My favorite is the Old Boulevardier, a cross between my favorite aperitivo, the Boulevardier, and my after-dinner concoction of choice, the Old Fashioned. The recipe was a collaboration between Francesco Bonazzi, Fede Figliola and Nico Scarnera. Joe Schofield is the new bar manager at Tippling Club and has come up with a brilliant cocktail menu where you pick your drink based on perfumed sticks. The accompanying cocktail will give you a similar sensorial experience as the perfume. My favorite drink was the Caramel cocktail featuring aged rum, Myers, lemon, salted caramel, egg yolk and salt. The caramel lollipop served on the side will bring you back to the happiest days of your childhood. Marco Russo is a god to me. He is the artist behind the masterpieces The Lighthouse of Scotland, Pure Cocktail, Martesana and El Milanes. Recently, he came up Inferno, my favorite from the Paradise cocktail book at 1930. Served literally on fire in a fire-resistant tin cup, Inferno is a spicy and complex drink that will have you craving another. It features 6 drops of grapefruit bitter, 7.5 mL of paprika syrup, 7 mL of distilled pepper, 45 mL of mescal, 2.5 mL of Ferro-china and 10 mL of Ancho Reyes. 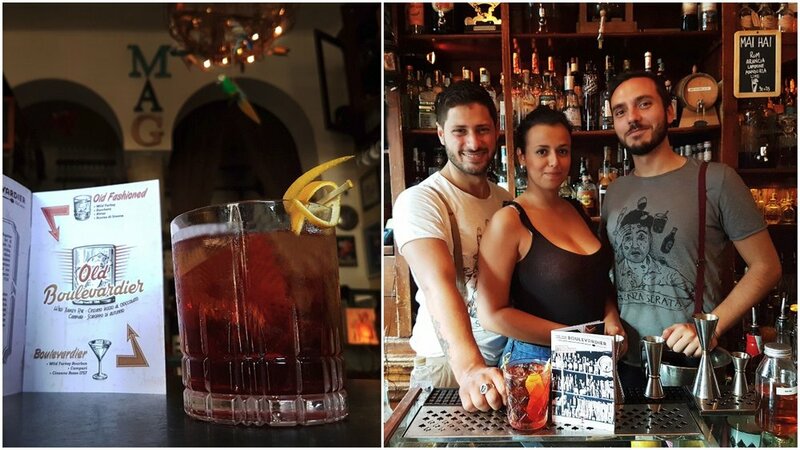 Thanks to a collaboration between the boys of Freni e Frizioni and Jerry Thomas, Rome now has an awesome bar called La Punta, which specializes in Agave-based drinks. I tried 7 cocktails on 3 separate trips to La Punta. Amazingly, every drink I had at La Punta was great, even if they were made by 5 different bartenders. This is a testament to depth of the bar team and the well-managed drinks program by Cristian Bugiada and Roberto Artusio. My favorite was the silky and smokey Mala Education (by Roberto Artusio) with mezcal, grapefruit juice, rhubard, agave honey, habanero bitter and egg white. Thanks to Mauro Foglietta for the beautifully prepared drink. Jerk It Like Its Hot with Jerk infused Jamaican rum, pimento dram, coke syrup, charred pineapple juice. Apart from the provocative name, this drink caught my eye because of the Jerk infusion. Jerk is a style of cooking in Jamaica where meat is prepared with a spicy mix consisting primarily of allspice (pimento) and Scotch bonnet peppers. It works beautifully in this drink by ilo Hys Occhipinti, which is my favorite on the new menu. The coca cola syrup is also a great addition, which you can appreciate the most on the finish. Pier Strazzeri's BoulevarPier features 45 mL Carpano Antica Formula, 25 mL Campari, 20 mL Knob Creek and a spoon of Pedro Ximenez, The Pedro Ximenez sherry gives even more elegance to my favorite pre dinner drink. Bar Castello is a short 30 min journey from Milano and is definitely worth a trip for the great drinks, beautiful atmosphere and fun people. The sharp flavor of the bell pepper perfectly complements the tequila base of this refreshing cocktail. The staff at Pinch suggest to lick the bell pepper salt on the outside of the glass before taking a swig of this delicious cocktail. Elisa demonstrates how this done below. Ingredients: Tequila blanco, bell pepper cordial, sugar, orange juice, Ichnusa beer, crust of bell pepper infused salt. Love this drink Erik Viola! Juniper is a cocktail bar/restaurant on Keefer St, joining Keefer bar and Bao Bei on one the best streets for drinking in Chinatown, Vancouver. The best drink on the menu is the Wing sang sour (by Shaun Layton) with malt whisky, lemon, toasted black sesame, ginger, mezcal, egg white. This drink reminded me of the delicious black sesame ball chinese dessert and is my favorite drink in my hometown. I only had a short visit at Jigger and Pony, but I was blown away by their Donkey Kong cocktail. Based on Monkey Shoulder scotch infused with bananas, this tropical version of an Old Fashioned is one of the best drinks I've had in Singapore. The Underwood by Riccardo Corbetta features Cluny 5 yo, Macchia vermouth, Porcino Calabro, Talisker Skye and saline solution. The mushrooms from the Porcino Calabro liqueur give an extra layer to the whisky base (1.5 oz Cluny, 1 spoon of Talisker). Biggie and Tupac features 1 oz tequila ocho reposado, 3/4 oz hidalgo amontillado sherry, 3/4 oz maurin blanc vermouth, 1/4 oz honey, 7 dashes jasmine and sage tea with meyer lemon. This drink pairs perfectly with the tasty fries at Trick Dog in the Mission, SF. Props to bar manager Morgan Schick for the great hospitality.